Westborough/Worcester – What may be currently the most successful sport at Westborough High based on wins and losses may also be, some say, the one that most often flies under the radar in terms of recognition and fan support. 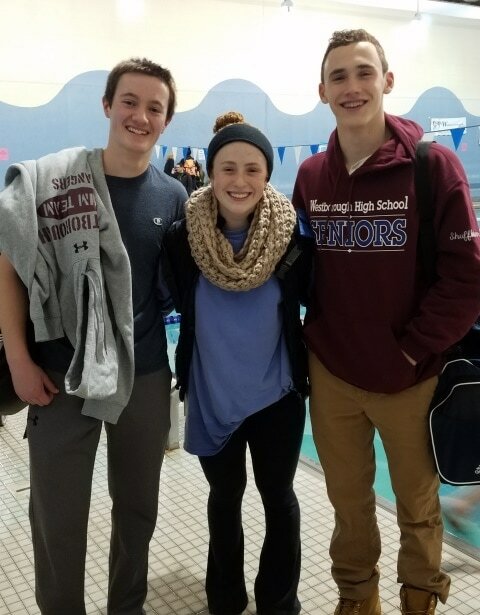 The school’s co-ed swim team may not receive the marquee headlines, the overwhelming accolades and outpouring of adulation as other big-ticket teams, but a closer look at the accomplishments of these Ranger swimmers may give pause as to just why not. The 2015-2016 campaign saw an undefeated season for the boys with a perfect 11-0 record while the girls compiled a winning season as well at 6-5. Just how far this team can advance and how long the boys win-streak can continue will be fun to watch as the squad moves on from their opening meet versus Wachusett Regional High held at Worcester’s Jewish Community Center Dec. 9. The boys extended their streak of victories with first-place swims by Ryan Shufflebarger (200 and 500 free), Justin Papagelis (200 IM and 100 fly) and Spencer Brownewell (100 free and 100 backstroke). Each attained State qualifications for their successful performances. In addition, Aaron Wong and Louis Gencarelli each won their events, the 100 breaststroke and 50 free, respectively. Ranger teams also captured all three relay events – 200 medley, 200 free and 400 free. While the girls fell, 92-78, a number of quality performances leading to victories were achieved by Emma Kudej (50 free), Rachel Shufflebarger (100 fly), Jordan Connolly (500 free) and Marisa Papagelis (100 backstroke). The same swimmers teamed up in the 200 medley relay and the 400 free relay winning and qualifying for States and Sectionals. Other second-place finishers were Jordan Connolly (200 IM), Caitlin Papagelis (100 fly), Marisa Papagelis (100 free), Juliette Koehler (100 breaststroke) as well as the 200 free relay team of Claire Gagnon, Juliette Koehler, Natasha Nadar and Caitlin Papagelis. Earlier this month in a showing of community spirit, the team participated in its fourteenth-annual “swim-a-thon” that raised money for Ox-Fam America and the Worcester County Food Bank. The event was held at the Rangers home pool, the Westboro Tennis & Swim Club. Members of the 2016-2017 Westborough High co-ed swimming and diving team are seniors Deirdre Robins, Andrew Rosenfeld, Rachel Shuffelbarger, Ryan Shufflebarger; juniors Spencer Brownewell, Abigail Eastwood, Louis Gencarelli, Savant Liu, Natasha Nadar, Marisa Papagelis, Aaron Wong; sophomores Zac Colebourn, Jordan Connolly, Claire Gagnon, Miles Henderson, Juliette Koehler, Emelia Kudej, Aidan McDonald, Lydia O’Connell, Bram Townsend; freshmen Holly Carew, Ashlyn Murray, Nishka Pant, Caitlin Papagelis, Justin Papagelis, Jack Powers and Hemal Prajapati. Bergemann is assisted by Lindsay Burgess, Katie Cullen and manager Taylor Connolly. Next articleHappy holidays and wishing you a prosperous 2017!